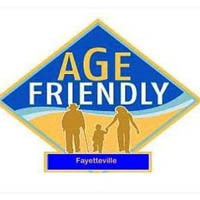 As a collaborative effort between the City of Fayetteville, the Fayetteville Chamber of Commerce and the University of Arkansas, Age-Friendly Fayetteville seeks to create a community that encourages and embraces active aging. By optimizing opportunities for health, participation, and security we hope to enhance the quality of life for all Fayette-villians as we age. Our goal is to increase the inclusiveness of older people with varying needs and capacities by developing a network of social, community, and civic supports that provide prospects for growth and development.